That’s Regina L. Potenza of Cuenca, Ecuador (meaning she’s a permanent expat here) and Sarasota Florida, on the left. 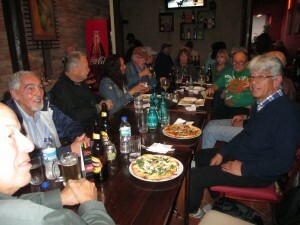 All over the world, wherever American retirees living abroad (Expats) are found, they will gather several times a week, and for every excuse….such as a Writer’s In Transition group, which I joined…..just to laugh, eat and have a few beers. Here’s the tableful, although truly, the whole restaurant was hopping with us. 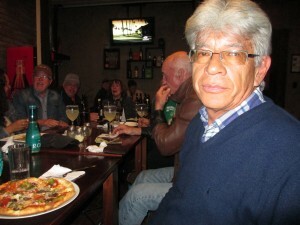 And, my Ecuadorian friend, Leonardo Echeverria, had never heard of Fabiano’s though he has lived in Cuenca for 35 years. So, he has now become a member of the local Expat Family. Today, I’m involved in stuffing my stuff into a rolling duffel and a large backpack preparing to get back out on the road and explore the coastal region of Ecuador…. including some exciting whale watching. The Pacific currents here are warm enough for calving, so the whales migrate to this coast from Antarctica between June and October. Then, on September 14, I will fly from Quito, Ecuador to Panama City, Panama and proceed to design my trip from there; eventually winding up in Denver, Colorado, for my annual family visit. And so, the sun sets spectacularly on this great adventure, outside of my kitchen window overlooking the Cuencan rooftops…. …..and the Turquoise Twins sashay into the sunset, as any good Western ends! 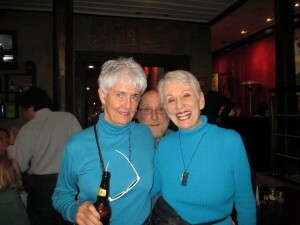 Men just seem to follow us! 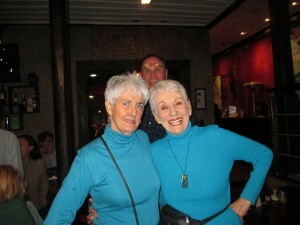 Note the three heads in each picture. Different guys, too! You can never have too many bright turtlenecks! I just went out today and bought more ($10 apiece). Hope I can get them all in my suitcase! 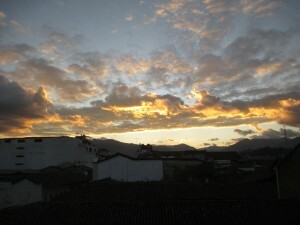 But, if that’s the biggest problem I face in my traveling life, I’m pretty darned lucky….and I’m the first to admit it.